Balloonatic Promotions- Hot Air Balloon Rides - Champagne Flights! If you're a first timer then we invite you to check out the site. We offer a complete line of hot air balloon services from Champagne Balloon Flights to Flight Instruction and Balloon Sales . 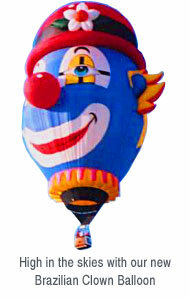 Check out our photos which includes pictures of The Octopus Balloon and more pictures of the Brazilian Clown Balloon! While you are with us, please check our Events calendar to see if The Balloonatic is going to be in your area. Meet owner operator Ken Shumate and learn all About The Balloonatic himself, then contact us to book your exciting adventure above the clouds! The Balloonatic is always in the market for good used ballooning equipment. Please contact him if you can help him out.